Langka – Scientific name: Artocarpus heterophylla Lmk. 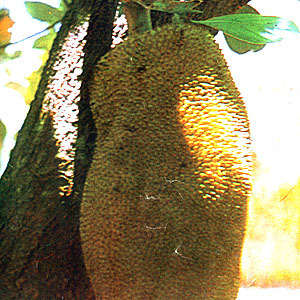 The langka, nangka or Jackfruit is perhaps one of the largest fruits in the world. It grows to about 1-1/2 – 2 feet long with short spines covering its body. When ripe, it gives off a very distinct aroma. The fruit is often wrapped with plastic while still hanging from the tree to prevent birds and insects, which cannot resist the sweet smell, from feasting on the succulent flesh. Langka is a fruit tree found throughout the Philippines. It is abundant on Mt. Banahaw. The ripe fruit is said to be demulcent, nutritive, and laxative. .. i love langka and sha love it too!! !